Gold bullion sales at the Perth Mint fell sharply in June 2013 when compared to the prior month, while silver bullion sales were basically flat. Sales levels for both metals remained ahead of year ago levels. 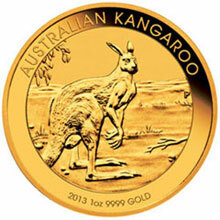 In April, Perth Mint bullion sales had surged, coinciding with a sharp drop in the market prices of the metals. Gold bullion sales had reached the record monthly sales total of 111,505.06 troy ounces. Silver bullion sales more than double compared to the prior month, reaching 1,102,465.96 ounces. In the following month, gold sales treated and silver sales dropped by more than half. Sales of silver as coins and minted products reached 588,630.13 troy ounces for June 2013, flat with the prior month. Once again, the latest monthly total did represent an increase from the year ago level of 523,663.46 ounces. For the year to date, Perth Mint gold bullion sales have now reached 405,624.92 ounces, while silver sales at at 3,783,593.08 ounces.